The Upeasy Seat Assist is a non-electric, self-powered lifting seat that provides up to70% lifting assistance for those weighing up to 340 lbs. The Upeasy Seat Assist is a non-electric, self-powered lifting seat that provides up to 70% lifting assistance for those weighing up to 340 lbs. This enables the user to maintain upper body strength. The patented LeveLift Technology™ allows the flexible seat to curve to a flat surface that lifts the patient up on a level plane, without dumping them forward. It also eases the patient slowly and gently into the chair. 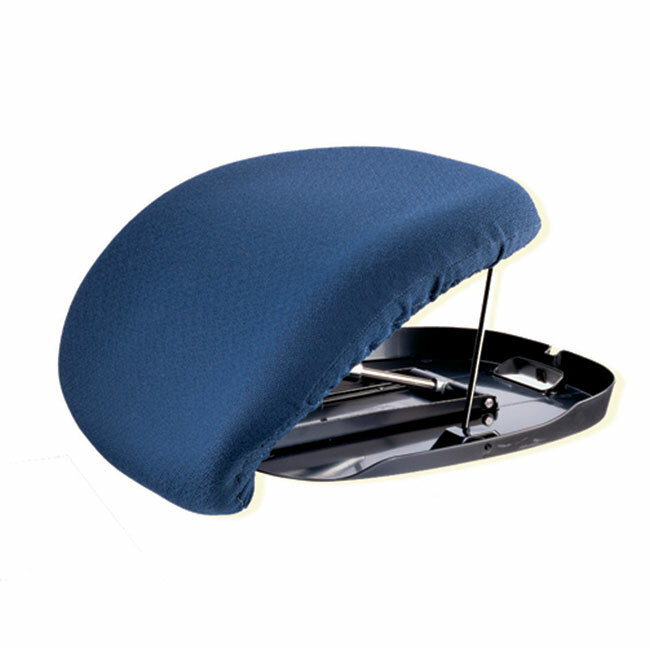 The polyurethane foam cushion has a washable polyester, slip-on cover. Lightweight with a built-in handle allows for the Upeasy Seat Assist to be used in or outside the home and on most armchairs or sofas. Patented LeveLift Technology™ with hydro-pneumatic lift actuator lifts up to 70% of body weight 10" high. It provides safe, controlled support to assist in standing and sitting. Self-powered; uses no electricity or batteries. Five different calibrated weight settings to suit to individual needs. Portable - use in or outside the home on most armchairs or sofas. Equipped with a carry handle and folds flat for easy transport. Marine blue 100% polyester slip-on cover (machine washable in cold water). Lifting Seat Dimensions (H x W x D): 19" x 17" x 4"
Box Dimensions (H x W x D): 18.8" x 16.5" x 4"